The largest ever purpose-built cruise ship for the UK market has been delivered to P&O Cruises and it’s set to begin crazy year for UK-based cruise ships. As you can see from the video the P&O Britaania is just about ready to make its debut in March 2015. At the moment it’s at the Fincantieri shipyard in Trieste, Italy which is also where the large vessel was constructed. Right now all the crew onboard and getting final preparations ready for departure to its new homeport of Southampton, UK. What a day! #Britannia is magnificent. We can’t wait for her to arrive in Southampton. 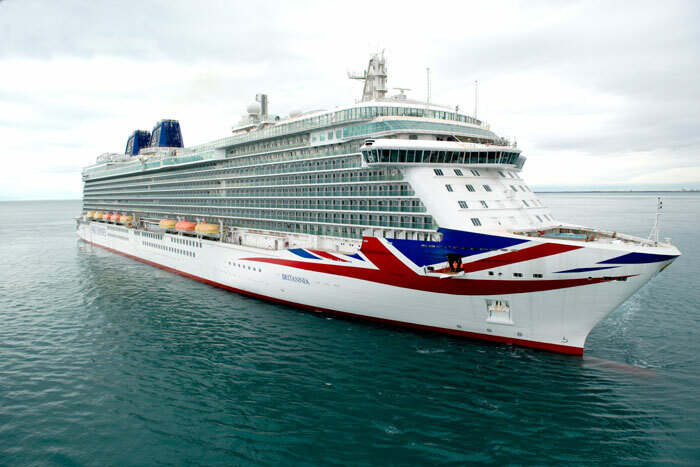 P&O Britannia will showcase its new Union jack livery on the bow across the oceans at 97 meters long (largest in the world) along with its new blue funnels. The new ship can accommodate 4,324 passengers and they will be able to enjoy splendid ship that compliments the cruise lines past with modern new dining venues and onboard features. Still to come from P&O Cruises is the announcement of the ships God Mother. There is rumor that Cruise Hive previously reported on that it could be Her Majesty the Queen herself! She will be in the region on March 10th which is only a few days before the ship sets sail on its debut voyage. All will be revealed! P&O Britannia is 144,00 gross tons and will spend its inaugural cruises in Europe during the summer going head to head with Royal Caribbeans Anthem of the Seas which will also sailing from Southampton. Britannia will then spend the winter season sailing the Caribbean.